Jon Johnson Photo/Gila Valley Central: Morenci’s Marlo Day shows her butterfly skills. 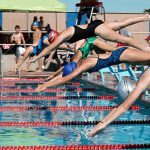 SAFFORD – After a little more than a month of daily practice, the Gila Valley’s swim team season ended with a splash Saturday as Safford hosted the summer league finals. 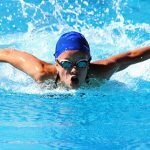 Swimmers from Morenci, Thatcher, Pima and Safford converged at Firth Park to pit the best of the best against each other. 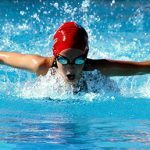 While everyone on a team swims in a regular swim meet, only the top eight in each category swims in finals, with the top three finishers in each event receiving a medal. 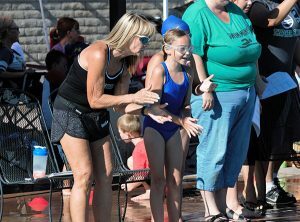 Pima head coach Natalie Schlittenhardt gives instruction to Liliana Johnson before her leg of the medley relay, which opened the swim team finals meet. The swim of the night was put on between Morenci’s Marlo Day and Thatcher’s Avery Johnson, who battled throughout the meet for supremacy of the 11-12 girls bracket, including a thrilling and captivating performance in the 100 Individual Medley. Johnson started out of the gate strong and managed to build a body-length lead by the end of the backstroke leg. Day, who earlier cruised to a gold in the breaststroke, chiseled away at Johnson’s lead, however, and it was all even going into the last freestyle leg. As both girls pushed themselves to their limits, Johnson edged out Day and finished victorious by touching the wall in first place by mere hundredths of a second. 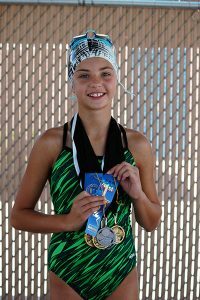 Thatcher’s Avery Johnson shows off the assortment of medals and ribbons she acquired at the Gila Valley Summer League Finals. Johnson finished the day with three gold and three silver medals in individual events and two first-place ribbons in relay events. All of the coaches said their favorite part of swim team was watching how much the swimmers improve over the summer. Thatcher head coach Lori Christensen also had nothing but praise for her swimmers. 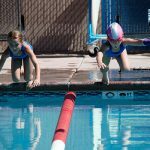 Jon Johnson Photo/Gila Valley Central: Pima’s Josie Peterson, left, and Avalon Johnson leap at the start of the six and under breaststroke. Jon Johnson Photo/Gila Valley Central: Pima’s Madison Taylor busts through the water. 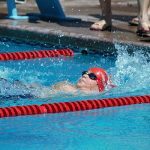 Jon Johnson Photo/Gila Valley Central: Morenci’s Quinton Wiltbank builds an insurmountable lead in the 9-10 boys 100 individual medley. Jon Johnson Photo/Gila Valley Central: Swimmers dive into the water at the start of the 13-14 girls freestyle. Avery Johnson and Marlo Day Jon Johnson Photo/Gila Valley Central: Thatcher’s Avery Johnson, left, and Morenci’s Marlo Day receive their medals for first- and second-place, respectively, in the 50 freestyle.